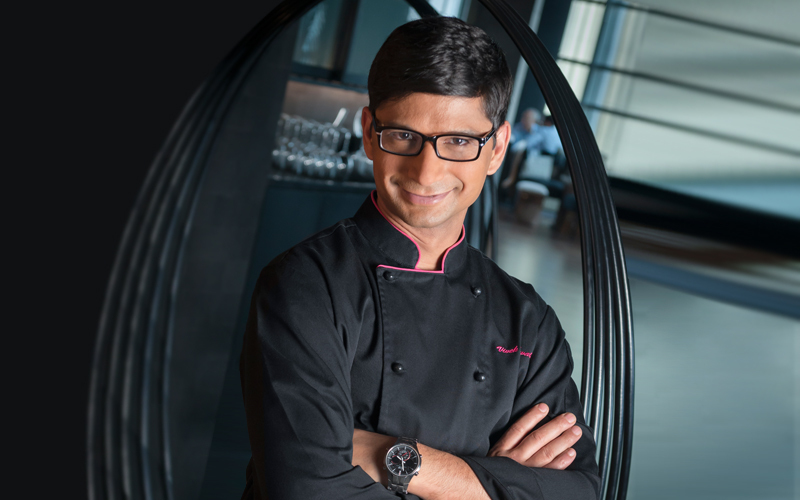 Award-winning head chef, Vivek Kashiwale from Mint Leaf of London in Dubai, talks about his home life as a vegetarian and what techniques he thinks it’s essential for home cooks to master. There used to be a street food hawker outside my school when I was young, and every afternoon we would all line up for quick street food, things like sugar string candies in all different shapes or homemade sodas, as children we always wanted the sweets. What we ate usually depended on what was left over from our tiffin purse. That was one event that we all used to look forward to at the end of every day. I absolutely love chocolate. Whether it’s chocolate cake, chocolate ice cream or even the occasional fried mars bar, I can’t help myself when it comes to chocolate! My guiltiest food pleasure would probably be eating Nutella on a cheese cracker – straight from the jar. I thought he was referring to the soufflé that I was staring at through the oven glass, but looking back I see his wider meaning. That’s the best advice I would give to my younger self – take your time, and have patience. What’s the most useful culinary technique or skill? I would say that the most useful culinary skill is to know and understand the balance of flavours, which herbs or spices complement each other and in what season they should be used in a menu. Not all spices marry well with other ingredients, so to know which flavours match, blend or complement each other is a must for any chef or aspiring home cook. What’s one piece of kitchen equipment you could not live without? My spice grinder. Spice blends are the basis of all Indian cooking, and one thing that is used in almost every Indian household kitchen is a mortar and pestle. In commercial kitchens, these are replaced by spice grinders and they are invaluable! What is the must-know recipe every amateur chef should know and why? Garam Masala or blended hot spices that are often used in the Indian kitchen is something I believe every chef should know. Not every blend is the same and different blends exist for different dishes, but it is the mastery of combining these and having a recipe in place that is most important. Actually, I don’t usually cook at home. I’m lucky as my wife is an amazing chef and she does most of the cooking for us. She’s also a vegetarian, so home food is always veggie for me. What’s your favourite thing to cook and why? King prawns, one because I also love to eat them, and secondly because they are so versatile and there’s so much you can do with them – from curry, to the tandoor or oven. They soak in the flavours well, they look appealing and they taste divine. The thing that I love about cooking is that it gives me a channel for my creative side. From developing a thought, through the creative process and some trial and error, to seeing a dish become a reality on the plate, this is something that gives me a real sense of satisfaction each time. Not every guest is the same and with changing lifestyle and eating habits, their demands are different as well. What I like most is to meet these demands for each person, delivering a dish that suits what they need and seeing the satisfaction on each customer’s face. That’s a great feeling of a job well done.